Park Geun-hye, who faced imminent impeachment at the start of this week, blindsided opposition parties on Tuesday with what appeared to be an offer of resignation. And with this game-changing move, she has effectively put off impeachment and may even avoid it all together. Opposition parties drew up a motion for impeachment this week. They need a two-thirds majority for the motion to pass the National Assembly – which means they need at least twenty-eight members of the conservative Saenuri party to vote with them. And earlier in the week, it was looking like they had those twenty-eight votes in the bag due to an internal split within the Saenuri Party. So it looked as though the anti-Park faction in the Saenuri party would go along with the opposition parties’ motion for impeachment, which the opposition was planning on presenting for a vote on Friday. After Park’s announcement, the anti-Park forces in the Saenuri party had a sudden change of heart. They proposed to postpone the impeachment vote until December 9 to see if all parties can come to an agreement for a “stable transfer of power.” Meanwhile, the pro-Park forces have proposed a timeline of April 2017 for Park’s resignation, followed by a new election in June 2017. So for now, Park remains in the Blue House. And if the opposition parties are unable to secure a two-thirds majority by December 9, impeachment, which had seemed a foregone conclusion just a few days ago, may become out of reach. Embedded in Park’s announcement was an even more cunning ploy. Technically, Park’s public offer on Tuesday was not to “resign,” but to step down after a “reduced term” in accordance with “legal procedures.” Reducing the president’s term requires a constitutional amendment, which has been on the Saenuri party wish list for some time. Without a viable presidential contender, the Saenuri party has been wanting to overhaul the country’s political system into a parliamentary system, which would relegate the president to a largely ceremonial role and empower the federal legislature to choose a prime minister, who would act as the government head. The Saenuri party, confident that it can eventually lure members of the centrist People’s Party into an alliance to gain the upper hand in the legislature, believes changing to a parliamentary system is its best bet to secure its ruling power long term. 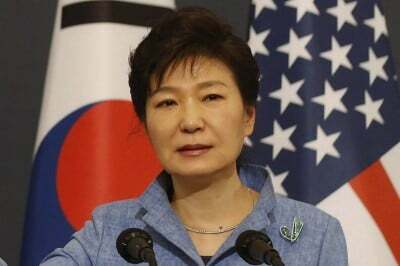 And discussion of legal procedures for reducing her term, as Park suggests, would open the door for the Saenuri party to propose the constitutional amendment and system overhaul it had been wanting to pursue all along. A well-played hand by Park. But the wild card that Park, or her puppeteer, hasn’t yet accounted for is the power of the mass protests on the streets. This week’s events have fueled even more public anger and brought out 2.12 million people in protests across the country today in the sixth consecutive week of protests. South Korean media report 200,000 in Busan, 100,000 in Gwangju, 50,000 in Daejeon, 10,000 in Jeju, 12,000 in South Jeolla, 15,000 in Jeonju, 15,000 in Ulsan, 4000 in Sejong and 1.6 million in Seoul. Some held up images of Park Geun-hye in handcuffs and prison garb. If the opposition parties’ gamble on impeachment fails on December 9, the line in the sand will only become clearer. It may finally consolidate the opposition around the people’s demands, which are–Park’s immediate resignation, investigation of the president for her involvement in the corruption scandal, and the dissolution of the Saenuri party.